Have you seen this Yahoo news article citing research by Shari Tishman at Harvard? Tishman describes seven "thinking dispositions" that good thinkers not only have but actively use. "1. The disposition to be broad and adventurous: The tendency to be open-minded, to explore alternative views; an alertness to narrow thinking; the ability to generate multiple options." "2. The disposition toward sustained intellectual curiosity: The tendency to wonder, probe, find problems, a zest for inquiry; an alertness for anomalies; the ability to observe closely and formulate questions." "3. The disposition to clarify and seek understanding: A desire to understand clearly, to seek connections and explanations; an alertness to unclarity and need for focus; an ability to build conceptualizations." "4. The disposition to be planful and strategic: The drive to set goals, to make and execute plans, to envision outcomes; alertness to lack of direction; the ability to formulate goals and plans." "5. The disposition to be intellectually careful: The urge for precision, organization, thoroughness; an alertness to possible error or inaccuracy; the ability to process information precisely." "6. The disposition to seek and evaluate reasons: The tendency to question the given, to demand justification; an alertness to the need for evidence; the ability to weigh and assess reasons." "7. The disposition to be metacognitive: The tendency to be aware of and monitor the flow of one's own thinking; alertness to complex thinking situations; the ability to exercise control of mental processes and to be reflective." 5. Therefore, we are limited to three educational instruments––the atmosphere of environment, the discipline of habit, and the presentation of living ideas. The P.N.E.U. Motto is: "Education is an atmosphere, a discipline, and a life." Our guest poster today is Megan Hoyt, a longtime Ambleside Online user and the author of Hildegard's Gift (see details below). Hildegard of Bingen is the AO composer for this term. When I first began reading about the early life of Hildegard of Bingen, twelfth century composer, artist, herbalist, visionary, and lover of God, I really began to identify with this mysterious, solitary child. Like other good Catholics of the Middle Ages, her parents sent her away to live as an anchoress in total isolation at an early age. As their tenth child, they considered her a “tithe to the church,” which seems like a beautiful and godly idea unless you are the frightened little girl being sent away. I was a frightened little girl, too – I was almost scared of my own shadow for most of my childhood and constantly worried about the social norms of school life, which seemed so elusive to me. I was mystical, too, in the sense that I genuinely “felt” connected to God when I worshipped at church. Unlike my peers, I cried while singing anthems in children’s choir. Christmas and Easter services? I sobbed through them. My parents called me sensitive. My Aunt Gretchen said I was one of God’s special ones. Looking back, I now wonder if I had a form of clinical depression. Perhaps that’s why I so strongly identified with young Hildegard’s first teetering steps into the cell where she would spend years of her life, praying alone. I could definitely see myself being happy in isolation like Hildegard. And that is the duty of an anchoress, in case you didn’t know – they must live a secluded life as cloistered nuns. I wonder. Did Hildegard WANT to join the convent at Disibodenberg? She was only eight years old, after all. Did she agree with her parents’ decision? She certainly embraced her new life. And the world is better for it. But where does our genuine responsibility for accepting the advice of our parents end? Where does it begin? I really don’t have any idea. It’s a new thought for me – do we have choices when we’re very young? Do we get to decide to love God or are we simply expected to? See, I told you I was mystical. I could sit and ponder these things all day and never accomplish anything else. I have read two or three of Hildegard’s books now and even written one of my own about her, Hildegard’s Gift, available through Paraclete Press. The more I read, the more I love this little girl with a giant heart. She seems so intimately acquainted with God and so firm in her convictions about how we should live. Reading even a few excerpted quotes from her chant music refreshes my soul and gives me fresh hope for the future. Taking time to contemplate, to brood, to rest in the presence of our Lord is so important and also richly rewarding in this fragmented, hurry along culture of ours. The child Hildegard grew up, of course, as we all must. Her adult years were spent as an Abbess, leading others, writing letters of conviction and encouragement to popes, bishops, and princes. She was a strong woman with the courage to confront those living in sin. She also wrote plays, operettas, and listened for God’s whispered design for herbal remedies. Here are a few of her thoughts. They may seem a little silly now, but when she wrote them, there was no medical care, no medicine at all really. The head of a catfish should never be eaten—it lacks viriditas (greening power) and will cause headaches and fevers. Spelt rectifies the flesh, produces proper blood, and creates a happy mind and a joyful human disposition. Hildegard was a remarkable and complex woman with many talents, but she considered herself merely “a feather on the breath of God.” May we all trust God so much that we float on the wind of the Spirit, on the very breath of our sustaining God. Megan Hoyt is a veteran writer with credits in television and print. Her children’s book, Hildegard’s Gift, illustrated by David Hill, was released by Paraclete Press in 2014. Recipes, a secret alphabet, and coloring sheets are all available at her website. For the Orthodox and Catholic among us, Hildegard’s Feast Day is September 17. From The Parents' Review: Only these days we do it on a phone? If you've looked at the AO Plutarch page lately, you may have noticed that we have changed the schedule of the Lives that we will be reading. The schedule for the coming school year schedule will stay the same, but starting next year we will be adding a few new Lives to the rotation, and taking a couple out that don't have as much to offer the area of Citizenship. There are revised study notes up now for this term's Life of Crassus, and for Aemilius Paulus in the spring term. Both of these have Thomas North's text included. Let us know how they work for you and your students! In which Ralph Vaughan Williams writes to the children of the P.U.S. Have we really been taught that all composers are dead? Then indeed our art is dead. Vital art must be creative. It has been said that we should stand in the present with one eye on the past and one on the future. Let us by all means build our house on the foundations of the great masters, but let us remember that the composers of our own time and of our own country have something to say to us which even the greatest masters of the past age cannot give us; that is the only way we can build a great future for our music. We must not let let the dead lion swallow up the living dog. From the Letters of Ralph Vaughan Williams, 1895-1958, edited by Hugh Cobbe. Retrieved from Google Books. If you were making a Charlotte Mason t-shirt, what would it say? Right away you have your choice of well-used CM mottoes. I am, I can, I ought, I will. Education is an atmosphere, a discipline, a life. Things, Books, Ideas. Knowledge of God, Knowledge of Man, Knowledge of the Universe. Keep calm and CM on (I just made that one up). If you had to use your own words, though, what would spell it out best? I kind of like "Learning all the Time," but John Holt already used it. Same with "Beyond Ourselves" (Catherine Marshall). How about "Knowledge is Just One Idea at a Time?" "My understanding of learning is based on a learning-centred approach to learning-teaching interactions. The learning-centred approach focuses primarily on the learning process and the characteristics of the learner, and secondarily on teaching and the characteristics of those who help the learner to learn. Only when I focus my attention on the learning process and the learner do I understand more clearly what competent teaching, facilitating, training, planning, advising, and counselling processes would be like." In other words, it's not about the teacher, and it's not even (primarily) about the content: it's about the meaning and connections that the student makes with that content. The science of relations, self-education. "the content (knowledge or skills) to be learned and how it is organized and presented...; the cognitive strategies and skills to be used and how these can be strengthened through training [Herbart rules!] ; appropriate learning behaviours and how these can be elicited and modified through selected stimuli and reinforcement; the technologies to be used as an aid to learning and how they limit or enhance learning; or the facilitator and his or her facilitating activities." "In these approaches, learners would be perceived and assessed in terms of their competency to learn the content, how well they use cognitive strategies..." etc. See where it goes? We as teachers judge, assess the students based on our own focus. If our focus is content-based, we will be satisfied if they can parrot back the content. If we think it's all about behaviourism, we'll be marking them on what they do when we ring our little bells. If it's all about the teacher...heaven help us. Now all this is part of an approach to adult education, in all its possible situations and contexts. And if you imagine a night school class, what she's saying seems like common sense. You sign up for a class in computer skills or cooking or counselling, and you (the learner) have certain expectations. You certainly have the right to hope that, in most cases, such a class will be as much about you, the learner, learning, as it will be about the content; to hope that the instructor, if it's a small enough class, will have at least some interest in who you are and what you bring to the course. (Clarification: I don't mean getting all chummy with the teacher, but more in the sense of how the course is designed.) Most people will understand this naturally, because even if they never teach a class themselves, they will almost certainly have to, or choose to, sit through training sessions or upgrading courses or even sermons. And although such courses might have some very specific content to be learned (like welding skills), it still makes a difference who's learning it and what they then go and do with it. The irony, for those familiar with Charlotte Mason's philosophy, is that this is old stuff for us. That's what we do too. That's how we teach children. As Cindy Rollins said in a 2013 Circe talk, it's not what we teach, it's what they learn. So the question that it raises for me is--if that's how adult education is served up in the big world (and that's a good thing), are the kids still stuck with chicken nuggets and canned pasta? Is some researcher or professor out there saying the same thing to elementary and high school teachers? The Teaching Gap: Best Ideas from the World's Teachers for Improving Education in the Classroom, by James W. Stigler and James Hiebert. Copyright 1999, Free Press (a division of Simon and Schuster, Inc.); new edition with Afterword, 2009. In another PR article, Miss Kitching emphasizes that since the PNEU methods are methods, not systems, it is important that we begin with the philosophical principles behind the methods, rather than the other way around. She says something that might surprise homeschoolers who have spent many hours trying to figure out "the CM way to do things": that there is no one, absolute, foolproof CM-approved way to teach any particular subject, to do any particular activity--and she refers specifically to the question of how to teach reading. Yes, the PNEU provided booklists and timetables, marked exams, organized meetings, and provided many years of Parents' Review articles to try to answer the many questions that parents asked. Yes, Charlotte Mason wrote about how to keep a nature notebook and do a picture talk. But in the end, a good teacher, working on the right educational principles, providing a generous curriculum, respecting the minds of the students, will probably do a good job overall without having to have every last instruction spelled out. I found that second article particularly interesting, because I just finished reading a much more recent book that agrees, in many ways, with the "big picture" that Elsie Kitching describes. In the early 1990's, a project called the Third International Mathematics and Science Study (TIMSS) videotaped eight-grade mathematics classes in the United States, Germany, and Japan. The book The Teaching Gap is not, as its subtitle might suggest, a collection of hints from teachers around the world, but a description and summary of what the researchers found out during that project. There were a total of 231 classes chosen randomly and filmed during a "typical" lesson; then the videos were studied by an international team of researchers. They looked for patterns within the three countries, and for differences between them that might account for generally higher math test scores, for example, in Japan. Were the Japanese teachers doing something special that the German and American teachers had missed? Were there things that the American educational system could incorporate into math classes? To give a short answer, the researchers (at that point) found a number of differences between the three countries. Not every Japanese or German teacher taught the same way, and not every teacher taught the same way all the time, but there were enough common factors to establish some patterns. Much of the difference came down to the facts that the best teachers allowed students to engage directly with challenging mathematics problems, and that the best lessons seemed to be presented as a sort of story--not in a literary sense, but as something planned with an opening, a middle, and an end, and periods of seatwork or group activity were part of that story as well. The researchers, in the original book, spent quite a bit of time discussing one particular, uniquely Japanese aid to teaching: teams of teachers would regularly meet together to plan specific lessons, from beginning to end, down to the last example. Since they had a national curriculum, this meant that a local method for teaching "grade 2 math, chapter 2" or whatever could be passed on to teachers in other areas. As well as adding to what you might call the "lesson bank," this sort of activity seemed to be particularly important in teacher development and training. The teachers were working together to improve the students' experiences in every subject, and they themselves were learning to be better teachers by participating in these projects. Their own experience was valued, because they were the people on the front lines. The final question of the book was not whether the Americans should just adopt particular Japanese or even German teaching methods, for instance, getting together to plan lessons. The researchers agreed that it would not be enough for teachers in one country to attempt to superficially imitate, or to be told to imitate, exactly what was done in another place, without changing the whole structure of education first. In other words, principles, not surface methods, were what mattered, and one needed to be in place before much change could be seen in the other. They also agreed that the focus needed to shift from "teachers" to "teaching," and that teaching could improve only if there was acknowledgement that a country's cultural notions of schools and teaching--the "script"--needed to change. What does all this have to do with Elsie Kitching, with Charlotte Mason, and with homeschooling parents? As Elsie said, it's easy to miss the wood for the trees. We can't do the how-to if we're missing the why-to; but if our why-to is firmly in place, we will often see the how. It might not be exactly the same as somebody else's how. We may be teaching in different places; even in different centuries. We may stalk up and down overcrowded classroom aisles like Marva Collins, or sit on a couch with one child snuggled against us. We may use this math program, or that one. We may find that it works to put all the "seatwork" together in a bunch and to do several book lessons back to back; or we may have children who work better with a more varied timetable. And, like the Japanese teachers, we can definitely improve. We can support each other, we can work with each other to talk about what worked well and what didn't, we can discuss books that we (the teachers) are reading together, we can even write class notes and lessons for each others' benefit. In some ways, I think online homeschoolers have some of the best of all worlds: we certainly are not working in isolation! Although The Teaching Gap is specifically about large educational systems, public schools, and classrooms, there is much in the book for home educators to think about. In addition, we are, like it or not, part of cultures that hold "scripts" about education and schools, and those expectations affect us even if our own children are not in those classrooms. Overall, a very interesting book, particularly as a bit of inspiration to examine the teaching "scripts" that we find ourselves following--and to rewrite them when needed. Have you read the Christian Science Monitor article about people being so distracted that they can't pay attention long enough to read anything demanding, even if they want to? It popped up for me on Yahoo a few days ago, and I actually read it. I do read things. But then that's what I do. And on the other end, there are people who really never did read much in the first place, so superimposing the distraction of technology on them isn't going to make a lot of difference. I'm trying to put myself in the place of someone who used to read, used to want to read, and who has actually changed that because of "digital distraction." Is there really such a person? Maybe, maybe not. I'm more concerned about how this applies to children, learning or not learning. If the office workers cited in the article were interrupted about every three minutes and took twenty-three minutes to get back on task-and these were adults--is it any easier for children who are constantly interrupted and distracted? It sounds as if we're putting ourselves, or being put, into an ADHD experiment.. The question is, why would we want to do that to ourselves, and more so, to our children? And check out this observation: "I see people of all ages around me abandoning the moment they're in to search for something better." The author blames this, again, on the intrusion of technology, claiming that a friend found a miraculous cure by abandoning a fancier phone for a flip phone. Wow, if that was all it took...the funny thing is, I don't even have a flip phone, and I still get distracted. Not enough not to read, but just trying to keep all the usual balls in the air. But this friend, apparently, could not bring himself to read books as long as he felt enslaved to his do-everything, don't-abandon-me piece of technology. (Doesn't that remind you a bit of those Japanese electronic "virtual pet" toys, popular about fifteen years ago, that demanded to be fed and coddled hour on the hour? Is it possible that those were just training wheels for "SmartBerries" and the rest?) Well, anyway, there we seem to have our Exhibit A, somebody who would have read, could have read, but who was too busy to stop and seriously look a book in the eye. Well, good for him, at least. But again, he's an adult. He knows better and he can make his own choices. What concerns us are the children, our own and those around us. Are we allowing them a great deal time free of distractions? We may have to deliberately create that--I don't mean sabotaging the devices, but at least going places where they're not wanted or not allowed, and that can include "unplugged" places and times within our own homes. If education is an atmosphere, a discipline, and a life, we need to be vigilant about guarding all three. With young children, we can play with them, with our own gadgets turned off of course. We can do as Charlotte Mason suggests in "Inconstant Kitty," and encourage them to finish the game, play with the same toy a bit longer, go a little slower and more carefully at building something. We can provide toys with many possibilities. We can even do as the mama in All-of-a-Kind Family did with chores: she hid buttons (and occasionally pennies) when the little girls were dusting, so that they had to do a very thorough job to find them all. If we homeschool, we can practice the disciplines, create the habits that do teach them to concentrate, pay attention, observe--and then record observations non-electronically. If we teach classes or work with groups of children, we can provide books and activities that absorb them, that make them suddenly come up for air and ask for another chapter, more time to keep working or watching something. Some will say that is not exactly cutting-edge. But in a world where distraction is the new normal--maybe it is. Charlotte Mason's methods are not (thank goodness!) associated with stages. However, she did in fact talk about two stages of education. It isn't the focus of her principles, but her methods are worked out to serve the needs of the stage that was most relevant to her pupils. Charlotte Mason tells us that "education is the science of relations." The idea that vivifies teaching in the Parents' Union is that Education is the Science of Relations; by which phrase we mean that children come into the world with a natural 'appetency,' to use Coleridge's word, for, and affinity with, all the material of knowledge; for interest in the heroic past and in the age of myths; for a desire to know about everything that moves and lives, about strange places and strange peoples; for a wish to handle material and to make; a desire to run and ride and row and do whatever the law of gravitation permits. Therefore we do not feel it is lawful in the early days of a child's life to select certain subjects for his education to the exclusion of others; to say he shall not learn Latin, for example, or shall not learn Science; but we endeavour that he shall have relations of pleasure and intimacy established with as many as possible of the interests proper to him; not learning a slight or incomplete smattering about this or that subject, but plunging into vital knowledge, with a great field before him which in all his life he will not be able to explore. What does that have to do with stages? Well, we see that Charlotte speaks of "the early days of a child's life." The first stage, obviously, begins at the beginning, and the work of this stage is to develop relations with every area of knowledge. Charlotte Mason mentions her stages in volume 5 of her educational series, Formation of Character, which is not often read because it is less practical, and it is probably for this reason that we have been spared a rigid system forming around these stages. There is also a time for sowing the seed of this knowledge, an intellectual as well as a natural springtime; and it would be interesting to examine the question, how far it is possible to prosecute any branch of knowledge, the sowing and germination of which has not taken place in early youth. It follows that the first three lustres belong to what we may call the synthetic stage of education, during which his reading should be wide and varied enough to allow the young scholar to get into living touch with earth-knowledge, history, literature, and much besides. These things are necessary for his intellectual life, and are especially necessary to give him material for the second stage of his education, the analytic, which, indeed, continues with us to the end. The "first three lustres" is fifteen years, so all the years prior to our high school, and even the first year or two of high school, may be considered part of this "synthetic" stage. This is a time for gathering first-hand knowledge, developing relationships with every area of learning, and establishing that affection for knowledge that is the foundation for what Charlotte Mason tells us is the vital question about education--not "how much does the youth know?" but "how much does he care?" After he has learned to care, his maturer mind is ready to analyze what he knows. For most educators in the 21st century, analysis is the first object, and we expect children to analyze what they learn as soon as they trot off to kindergarten. Charlotte Mason understood that analysis was the work of a mind "throughly furnished" with much knowledge, and the first stage of education--a long one, allowing plenty of time for relationships to develop--was a time to synthesize knowledge. Most of us know what analysis looks like, and how to approach knowledge analytically, because this is how we are taught in institutional schools. The idea of synthesizing knowledge might be confusing, but Charlotte Mason has distilled the idea in her principle that "education is the science of relations." If we pursue the idea of developing a relationship with every area of knowledge, we are well on the way to making the most of that first stage of education--the synthetic stage--which lays the foundation for the later work of a mature mind. The master must not omit to set as an exercise the reproduction of what he has given to the class. It involves time and trouble to the teacher, I know well but it is essential. A literal reproduction of the matter taught is, of course, not required - but the substance of it presented in the pupil's own way. Every pupil should acquire the habit of acting as a teacher. This will happen if, after the teacher has fully demonstrated and expounded something, the pupil himself is immediately required to give a satisfactory demonstration and exposition of the same thing in the same manner. Furthermore, pupils should be instructed to relate what they learn in school to their parents or servants at home or to anyone else capable of understanding such matters. This practice will serve various useful purposes: In the first place, pupils will be more attentive to every part of the teacher's exposition if they know that presently they will have to repeat the same matter and if each one fears that perhaps he will be the first to be asked to do so. Second, by restating exactly what has been taught, everyone will imprint it more deeply in his understanding and memory. So what does it mean? Did Charlotte happen to stumble by chance over an ancient practice or did she discover it in the course of her wide reading on the topic of education? She doesn't tell us, but those of us who make narration an integral part of our educational efforts are not just following the advice of an obscure 19th-century British schoolteacher. We are sharing in a traditional practice of the past, and giving our students a share in the education of Quintilian, Erasmus, and Comenius...as well as Charlotte Mason! This is a "composite term" that I distilled from a number of Parents' Union School term programmes for Form III (grades 7-8). I chose Form III partly because it is the level my own daughter is using this term, but also because it's not too far off from the programmes for Form II (grades 4-6) and Form IV (grade 9). Form II is organized slightly differently and has fewer books; Form IV adds a few new subjects. It is not prescriptive in the sense that every single person and family who following Charlotte Mason's methods should organize their work in exactly this way; certainly if we've learned anything, it's that even in Charlotte Mason's own descriptions of schoolwork there could be variations. It is also not identical to the Ambleside Online yearly booklists, although AO is based largely on programmes like this one. Resources for formal, consecutive Bible study, including Old Testament history, the Gospels, and the Acts of the Apostles. Supporting resources such as a Bible atlas. Resources for personal daily reading (separate from schooltime work). Books(church history, missionary or other inspirational biographies) andappropriate activities for Sundays. Two or three pages or a passage to be prepared first from a newspaper, or, from the prose and poetry set for reading; a paragraph to be then dictated. Refer to a textbook or online source for lessons in meter. Read on Tuesdays some subject in "Literature," or on the news of the week, or, on some historical or allegorical subject, etc. Write on Thursdays an essay on the subject. Write narrative poems that must scan on events that have struck you. Write letters to friends on general news (or similar descriptive writing assignments). Choose a grammar book and continue to work through it. Parse and analyse from books read. The History of English Literature for Boys and Girls, by H. E. Marshall, pages appropriate to the history being studied. One Shakespeare play, can be chosen to correspond with history or Plutarch, (or one of the comedies). One worthwhile novel, usually related to history. Possibly a second book, essays or another novel. Poetry: know the poems of six poets. Reading. (including holiday and evening reading). Books set under Literature, History, Geography, Recitations, should afford exercise in careful reading and in composition. Poetry should be read daily. Chapters from Bulfinch's Age of Fable. Learn two Bible passages of about 20 verses each. Two hymns, two Psalms. Two modern poems, or a scene from Shakespeare, or two ballads. Chapters from main history book, and possibly a secondary source. Make a Century Chart of the time being studied. Read the daily news and keep a calendar or notebook of events. Ourselves (Book I), by Charlotte Mason; about 25 pages/term. Plutarch's Lives: usually one life per term, North's translation preferred. Reference materials such as a classical dictionary (for Plutarch and mythology). Books on government, economics, or other aspects of citizenship. Know something about foreign places coming into notice in the current newspapers. Map drills on the student's own country. Include the practical, "outdoor" type of geography (such as finding direction by the sun or stars), e.g by completing Scout/Guide badges. 1. Main book about plant life (ongoing) 2. A second book relating to natural history. Keep a Nature Note-Book, with flower and bird lists, and make daily notes. For out-of-door work choose some special seasonal study. Books or other materials for drawing instruction (if there is no teacher available). One special topic for the term such as animal studies. Illustrations of scenes from Literature. Study, describe (and draw from memory details of) six reproductions of pictures by one (sometimes two) artists. Follow the work of the term's composer, including biographical and other helpful material. Folk songs in English and in any other languages being studied. Technical work (sight singing). Home economics skills (including gardening, cooking, clothing design and sewing, laundry, mending), and general handicrafts. "Take the (Girl Guide) First Aid and Housecraft Tests." How do you keep resources and time organized in the upper years? Charlotte Mason supplied her students with a carefully thought out timetable. It made sure there was variety in the day, that a subject heavy in writing was followed by something different, and so on. This also helped to keep things running smoothly when there were different ages working together, needing the teacher's attention at different times. But since we want to encourage our students to take some responsibility for their own learning, we may decide to just give our older students a schedule or a list of things to be accomplished in the day or in the week, and let them figure out what to do when. At our house we are using a modified workbox system, where I load a row of magazine holders with the books we need for the day's school; but I also have a "teacher's binder" with lists of the chapters to be read and other ideas for the term. There are all kinds of ways to keep things on track, but which ones work best for you are going to depend on the particular needs and styles of you and your students, as well as whether you have your "courses" divided up into just a few major credits or not. It's not hard to provide a few drawers or folders marked "Math," "Science," "Literature" and so on; but some parts of a CM education don't fit perfectly into those categories, and you may prefer to keep things a bit looser. Cindy Rollins, longtime keeper of the Ordo Amoris blog, has a ritual called Morning Time, where all the students (and mom) get together and read things like poetry and Plutarch, do memory work, whatever works well as a group; and then they go off to do their invidual work. When I was homeschooling a middle schooler and a third/fourth grader together, we did a lot of combined readalouds and even things like science study together too; for those two years I tried to pick resources that would work for mixed grades. Again, you may have to try things out; some students work well together, some work best with a parent, and some want to do it all on their own. What are the possible pitfalls and problems of using CM in the upper years? What Daleks may try to exterminate your homeschool? 1. Don't compare, don't worry about what everyone else is doing (or how well they're doing it). 2. Don't underestimate the children, focusing on limits rather than possibilities. One pitfall might be to overdo everything, overload and burn out; but the other might be to assume that certain subjects or books are too long, too difficult, or not relevant to today's world. Charlotte said not to drop whole subject areas just because we ourselves think they're too dry or too hard; it is important to open as many doors as we can, do as much exploring as possible. 3. Even older kids need some variety, some surprises. Charlotte Mason criticized people whose dinner menus were too predictable; I think she would have said the same about lessons that were always the same. Unless you have one of those students who gets severely stressed by mom's attempts to mix things up (there are some of those too), it's good to include some little twists and surprises. Do some math or grammar orally. Play a math game. Spend some science periods looking through the microscope, or otherwise learning the material in a different way. Find something different or interesting to do on Tuesday mornings or Friday afternoons--that might be when you check out nature trails, or discount times at the museum, or visit an elderly neighbour. Captain's Log, Stardate 9529.1: This is the final cruise of the Starship Enterprise under my command. This ship and her history will shortly become the care of another crew. To them and their posterity will we commit our future. They will continue the voyages we have begun and journey to all the undiscovered countries, boldly going where no man - where no one - has gone before. You are the worldshakers, the innovaters, the ground-breakers, the brave ones. You may have to fight off a few Daleks on your journey through the galaxy, but the adventure will be worth it. And to add one thought for Christians who are listening or reading: I heard this week from a pastor (and former homeschool mom) who has organized a series of short-term missions trips to Asia, focusing on children's ministries. Being a person who likes order and organization, she always plans ahead as much as possible. On this particular trip, she felt unusually un-organized; her team was much smaller than originally planned, she had fewer ideas written down, and so on. However, she committed the trip (and her anxiety) to the Lord, and they went ahead, working in co-operation with a local church. Can you guess what happened? An unusually large number of children not only came for the programs, but committed their lives to Jesus Christ. When we are weakest, He is strongest. (Or to put it as the pastor did--when our binders are the emptiest, He has the most room to fill in the details.) This is not to discourage planning ahead!--but rather to remind us all of God's faithfulness. If He has called us to this journey, He can carry it out as well. We have not homeschooled any of our children all the way through high school. There were a variety of reasons for this, including the always-present question of "what will they do without a diploma?" Outside pressures may not matter in some homeschooling families, but for us they were at least a partial reason for the decision to take on public high school. I don't think it was that different during Charlotte Mason's lifetime, especially for middle to upper class boys who would have had to go to some kind of outside school to prepare for university. If you look at the study programs for her oldest senior high students, it is assumed that those students would be mostly girls. I think that there was an understanding of the school and university requirements at that time, and a need to work with the realities of that system; to give both the upper and lower-class students whatever they could for whatever time was available to them, before they had to go on to work or some other form of schooling. For us today it may be much the same; what seems to cause the most anxiety for homeschooling parents in the high school years is first of all teaching higher-level math and science and possibly English, and second, getting that work validated so that our students can move on to whatever post-secondary study or job or business they are planning for. I think Charlotte Mason would understand those kinds of outside expectations, although in her time they wouldn't have applied to so many students. In a perfect world, we might be able to provide CM-style education for everybody, all the way through, in small schools or in our homes; and in fact, it's getting really interesting to see what's happening now with the next generation of CM babies coming along, hearing about homeschooling parents who were brought up themselves to love good books, and who are just as likely as their kids to be interested in a bird on the lawn or a bug on the window. (You know the ads that say it's even more important to invest in girls' education than in boys', because the girls will be better parents and so on? I think Charlotte Mason would have totally agreed with that.) Anyway, yes, it can be hard trying to set up a whole science lab in your house, to teach senior math and literature especially if you're also teaching younger children at the same time; so if your students really are at the point where they need that kind of study and they also need to be credited for it, there are points where you may have to say, we've gone as far as we can; it's time for outside school. But if we can extend our children's CM opportunities by even a couple of years, maybe through grades nine and ten, and then let them take on whatever seems necessary in our culture and economy, they will still be that much the better for it. So if they are still at home, what should their schooling look like? This is a good description of Charlotte Mason principles in general; but I think, more than anything, that this is what you need to put in place for the upper years. If those three are in place, it doesn't matter so much whether you use science textbooks or not, how many languages you include, or even whether you read Plutarch. Rich curriculum: well, you can look at Ambleside Online as an example. You can look directly at what the Parents' Union School did in the upper years (via the original Progammes posted on the AO site). You can look on your own shelves, at library sales, at reviews of new books and other resources, at whatever's around you. Charlotte Mason referred regularly to having students complete Scout or Guide tests in areas of geography, First Aid, and homemaking. Where things come from is not so much the question as what we do with them. he upper years are a time when you get to try new "paper graces" (notebooks); for example, my seventh-grade daughter has been keeping a Book of Centuries, and this term we will add in a Century Chart. I might also note that when when of my other children, now in high school, went through some of the "homeschool relics" of her younger years, the only things she was really interested in keeping were the notebooks that she had really had a hand in designing or writing or illustrating. Teacher standing aside: We develop "trust", meaning trust in each other, in ourselves, in the student's mind. Trust in the process, trust in the general principles of CM. Trust in the work of the Holy Spirit. More to come in Part Four. I recently had the opportunity to talk to an Ontario workshop group about the challenges of teaching Charlotte-Mason-style in the upper grades. The time went too fast and after I got home, I realized that I didn't even get to some of the most important things I wanted to say. So here are some of the notes I had as I would have liked to present it...ironically, it begins with a reference to time travel. To many people, CM looks like this. 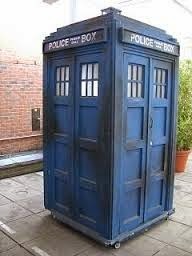 Dr. Who's time-travelling spaceship is permanently disguised as a 1960's British police call box. From the outside, it looks too small to be of practical value; technologically outdated; not even from this country. Interesting as a museum piece, but not that relevant or useful. However, when you open the door, you get a surprise. You see that the inside has very large proportions; how can this much inside could fit into such a small outside? It is fact a TARDIS, which stands for Time And Relative Dimensions in Space. It is a machine that can take you anywhere and any time, all at once. The TARDIS on Dr. Who has been rearranged and redecorated (or re-Doctorated) over time, but it still works essentially in the same way, for the same purposes. And on Doctor Who, those purposes can range from casual jaunts through time, to saving the entire universe from Daleks and Cybermen; in every episode there is a certain amount of risk. You also are taking a risk not only by homeschooling; not only by homeschooling through middle school and maybe high school; but by doing it CM style, which puts you really "out there." At times, you may feel like your Tardis has dropped you on some weird forsaken planet with no other signs of human life around. But there is good news there too: that you are not alone. The landscape of the upper years may not be densely populated, but it's not completely empty, not untillable. We're Canadians, after all—we're used to appreciating big underpopulated landscapes. In our own family we have used several of the Uncle Eric books on economics and government by Richard J. Maybury, and in his first book he begins by talking about models, like my (cardboard) model TARDIS. It's only a model, but models are a useful way of showing people what something looks like or explaining how something works. Uncle Eric says that everybody has certain mental models or ideas of how things work; and that if you see something or are told something that doesn't match up with the model you already have, you either have to reject that idea, or alter your model to fit the new information, and when you change your model, you experience a paradigm shift. For instance, when you see what's in the TARDIS, that challenges your belief that a big inside can't fit into a small outside. In the same way, we can allow ourselves to be astonished first at the large room that is a CM education, and further when we realize its potential for connecting us with other people of other times, with our earth and with the rest of the universe, cutting across the limits of time and geography. To use a favourite Scripture quote of Charlotte's, we have put our feet into a really large room. There are educational models that, over time, have become the accepted way to do things in our culture, that have made us forget sometimes what learning is about or that it can happen outside of a school, or without fitting into a box called the first or fourth or ninth grade. You might say that some contemporary approaches to education are about picking the chocolate chips out of cookies, examining them, and then trying to put them back in again; CM is more of a whole-cookie approach. It is definitely different from the "industrial model," the "brick in the wall" or piling-up-information model of education. It emphasizes respect for the individual, process over product, context over unconnected facts. It is a way of learning that is both innovative, cutting edge, stretching to the future, and also very much part of the classical tradition, reaching back towards the past. Charlotte Mason said that the only real education was self-education, which does not mean there is no place for a teacher but rather that each mind has to do its own learning. When you're sitting looking at a painting together, or drawing forget-me-nots in nature notebooks, or singing a folk song, or listening to a really interesting story together, there's a human rhythm, a natural drawing together that happens, there's no exclusion based on children vs adults, or younger children vs older ones; it is very much like a family. Charlotte Mason educators tend to like the word "community" rather than "co-op" to describe multi-family, group activities. This model is one that seems to naturally include people with disabilities and differences. It's not even limited to homeschoolers or those in private CM schools. I have seen articles written by people who learned their CM basics by homeschooling their children, but who are now reaching out and finding ways to use these ideas in Sunday Schools, Vacation Bible Schools, and with other groups of children, teenagers, and families. For instance, they might incorporate living books plus individualized notebooks. They might find ways to include art or music, or nature study, or gardening, or handicrafts, and they are finding that the same kids who were always bored with worksheets and colouring pages are getting engaged and excited about what they're learning. Are you excited yet? Can you imagine an education that looks like that? Doesn't it make sense that our creative Creator God would want us to approach education in a way that awakens our sense of wonder, that emphasizes close observation but also beauty?